Ask fellow campers about "Lucky Clover RV & Mobile Home Park" and nearby attractions. New owner here since we last stayed 3 years ago. Not much has changed in the park. Still quite a few very old single wide mobile homes are here. FHU 50amp site was fine, getting a 40' rig in and out can be a challenge. Sewer did back up on me when it was time to dump. Park is adding WIFI throughout the park rather than just at the office. Wish they would answer the phone when you call in. You will always get voice mail and wait for a return call. Office is only open from 9-2 weekdays and never on weekends. We camped at Lucky Clover RV & Mobile Home Park in a Motorhome. Park is less than a 1/2 mile from the ocean. Plenty of shopping nearby along with a multitude of restaurants. We made reservations in advance stating we had a 40' coach. After 5pm on Friday, there is nobody available from the office until Monday. The emergency phone # didn't work. We arrived and had trouble getting the coach THRU the park--cars were parked on both sides of the drive. There was one spot available and it had been "assigned" to us (all others were filled with old mobile homes and trailers in disrepair--didn't even feel comfortable going in). The one spot would NEVER accomodate a big rig either length or height. Plus there was a bush in front of the pad so we never would have even been able to get IN to the spot. DO NOT stay at this park--they are misleading, unavailable, and unless you have a very small camper, spots are unaccessible. We camped at Lucky Clover RV & Mobile Home Park in a Motorhome. Very old, dated park with many very old, single-wide mobile homes in various states of disrepair. Park is convenient to the beach and shopping of all kinds as well as restaurants. Wi-Fi is only available as a hotspot at the office. There are no showers or rest rooms and the laundry has cold water only. This park is a fairly good value but could use some serious updating. Pool is nice and kept up well. Rates are increasing as of 4/1/13. We camped at Lucky Clover RV & Mobile Home Park in a Motorhome. Rate based on monthly stay. We chose this location due to it's proximity to the beach and shopping. Older park & has been for sale for a number of years. Many single wide older, small mobile homes in the park. 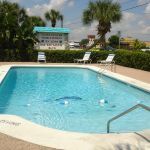 Staff is helpful and friendly, pool is always cleaned daily. Many restaurants, shopping nearby, while not a high end resort it is a great value because of the rate during high tourist season in my opinion. Many TV stations available with antennae since cable is only available from the cable company, internet hotspot is in guest lounge by front office. Have stayed here twice for a couple of months at a time during winter and will return again. Owner passed away in January so the future of the park might be in question. We camped at Lucky Clover RV & Mobile Home Park in a Motorhome. Not a great place, but better than a couple of others in the Melbourne area. Our son lives in town and we fulltime, so it is an option since it's actually closer to him, even though across the Indian River. The place is for sale and has been for 4 years, the price must be the reason for no sale, since it's within 1/2 mile of the ocean and a county park access. 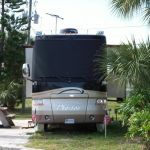 Easy access can be had to the RV/mobile home park off the Eau Gallie causeway. When we were here, there were many open sites, but it fills in the winter season per the manager. Many older mobile homes can be found in the park. We walked the beach every morning for sunrise for 10 days we were here, excellent beach! Wal-Mart, Publix, Winn-Dixie and several restaurants are with in walking distance. Check out the Green Turtle store, down the street. Has a great assortment of wines and seafood. 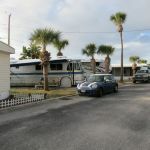 We camped at Lucky Clover RV & Mobile Home Park in a Motorhome. This is an older park with many permanent mobile homes. The staff is friendly. Sites are all back in. Wi-Fi is available but only at the office. There is not any cable service, but there is good antenna reception. We camped at Lucky Clover RV & Mobile Home Park in a Fifth Wheel. Are you affiliated with Lucky Clover RV & Mobile Home Park ?